As another part of the Ink Drop subscription from January, I finally got around to inking up the Verdigris sample from Rohrer & Klingner. This, like most of the samples, was one that I was completely unfamiliar with, so I looked it up online to see what I could expect. From what I could tell, I was expecting a black-green or black-teal color, which seemed like an interesting color that could add some interesting pop to the page. So, I inked it up in a Lamy Vista with a fine nib. First, let's talk about the properties of the ink. This is my first experience with this brand, so I was really interested to see how it behaved in the pen and on the page. I've heard many, many great things about several of the other inks from the brand. This ink is exceptionally smooth on the page. It's a real joy to write with. Dry time leaves something to be desired, but it's not terrible. If you're a left-handed writer, you might not do well with this one. There's a very small degree of shading that's really only noticeable under bright light. Even with a wide nib, it was difficult to coax out any shading. I didn't notice until taking pictures with an off-camera flash that there's a bit of sheen visible in this ink. If only this were visible under normal light, that would be fantastic! As it is, though, shading and sheen are hardly noticeable in real situations. Now, I don't intentionally sniff new inks, but I do notice any scents that come up while writing. This ink does have a slight scent, but it's not bad. It's very similar to other ink smells that I've noticed in the past. Cleaning the ink out of the pen is incredibly easy. I don't believe that this ink has the same reputation as other inks, such as Scabiosa, which has warnings about leaving it in a pen for long without being used because it's an iron gall ink. Of course, it's not a great idea to leave ink in a pen unused for too long, but Verdigris is more in line with "normal" inks. As far as a drip test, the ink did not do well. Not surprising, but worth mentioning since it does have some black in it. Which brings me to the color. This is a green-black ink that sometimes has some blue showing through, so maybe a teal-black. Either way, the black side of the ink is predominant in a way that makes the other colors difficult to detect. I've always disliked (insert color name here)-black inks that lean really far into the black territory, and this one is no exception. Keep in mind, this is just my own personal preference, but when using this ink, I'm disappointed by the lack of color on the page. Again, only in bright light is it possible to see the green (and sometimes blue) peeking through. For me, I like just a bit less black in these types of mixed inks, and Verdigris is just too dark. Is it a great ink? Absolutely. Is it one that I'll use again? Probably not. Why? The color (or lack thereof) just isn't for me. Keeping all that in mind, this might be just the ink you've been looking for, and, if so, I highly recommend it to you. Otherwise, I'd stay away unless you're looking for a black ink that sometimes lets a tad of green/blue peek through. 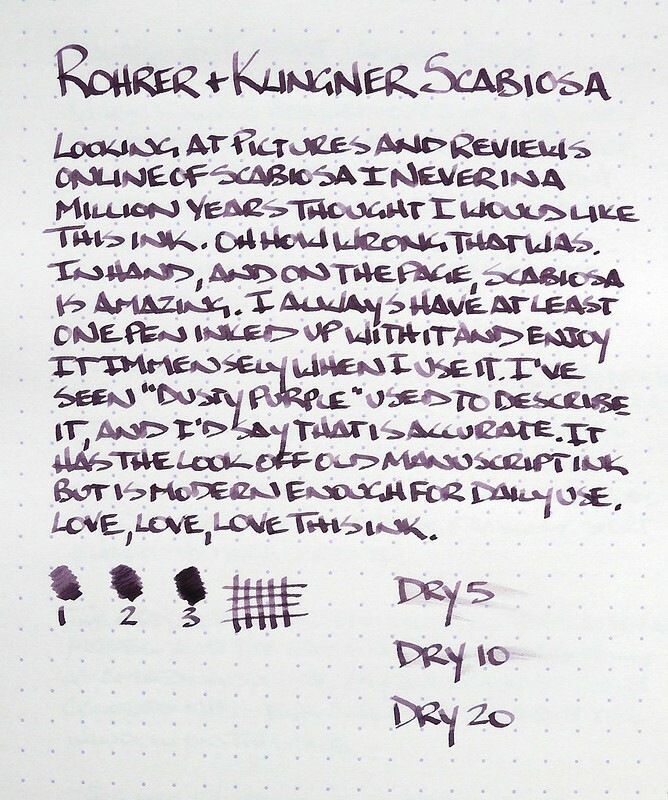 Posted on March 4, 2015 by Jeff Abbott and filed under Rohrer & Klingner, Ink Reviews. I don't ever think I have seen a picture of Rohrer & Klingner Scabiosa that accurately reflects what it looks like in person, the above picture included. That is why it took me so long to get on the bandwagon quite honestly. It never looked like a good fit. A sample vial from my friend Thomas changed all of that. From the very first time I inked it up I was hooked. I talk a lot about products that get everything "just right" and Scabiosa is one of them. The color - a dusty purple with hints of brown and grey - is just right. The amount of shading is just right. The dry time is just right. The ease of cleaning, even for an iron gall ink, is just right. 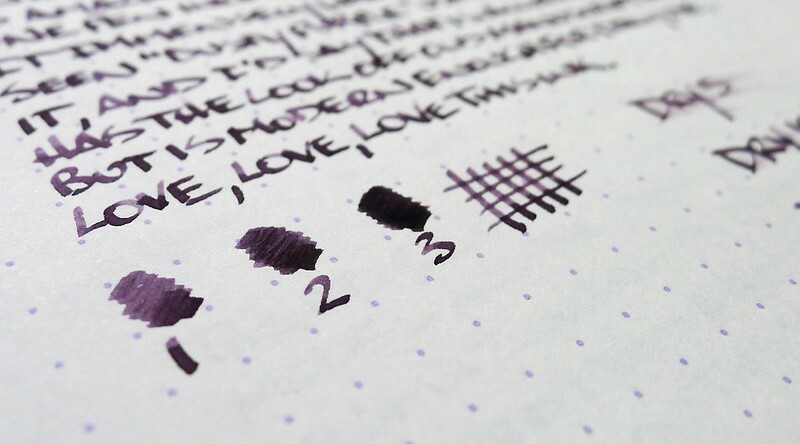 I like blue black fountain pen inks because they look classic - even historic - on the page. Scabiosa gives that same look. It stands out from the crowd while remaining professional enough to use in any situation. I have been keeping my TWSBI Mini 1.5 mm stub nib inked with it recently as my letter writing pen (this is also the pen used for this review). What a wonderful combination! I owe everyone a Top 5 fountain pen inks list, which I promise I will get to very soon. Look for Rohrer & Klingner Scabiosa to rank highly when it comes out. Posted on October 4, 2013 by Brad Dowdy and filed under Ink Reviews, Rohrer & Klingner. 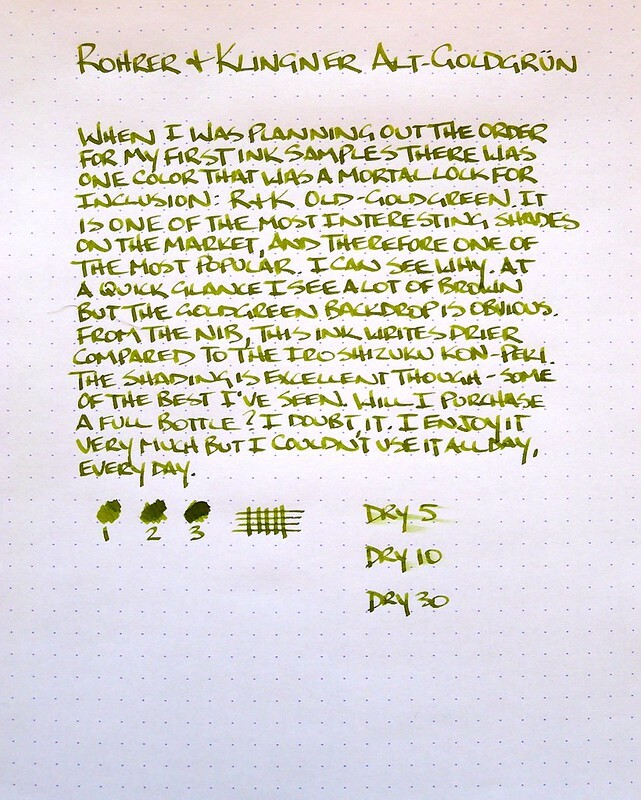 By all rights, there is no way I should like an ink like Rohrer & Klingner Alt-Goldgrün. Black inks and blue inks (and variations thereof) are my go-to colors, and it is rare that I find a non-standard color like Old Gold-Green making it into my daily carry. But wow, it is going to be hard to leave this one out. I first heard of this ink when I was working at JetPens. When we were considering carrying the R&K ink line most of the comments we received said something along the lines of "Decide how many of each ink color you are ordering, then double that for Alt-Goldgrün." Looking at the color online, I couldn't believe what I was hearing. This color has almost a cult following, and after using it, I can see why. The main reason why so many people love this ink is the shading. You can probably see it better in the larger size of the photo, but the range of colors on the page is outstanding. The greens range from olive to lime, with shades of gold, yellow, and brown coming through as well. It is a truly unique color. So now I have a dilemma. Do I go with a bottle of Alt-Goldgrün and commit to a regular load out? I'm not ready for that yet I don't think. I think the next step is to give it a good run in one of my F or EF nib pens and see how it performs. How many of you use Alt-Goldgrün on a regular basis? Posted on March 21, 2013 by Brad Dowdy and filed under Ink Reviews, Rohrer & Klingner.